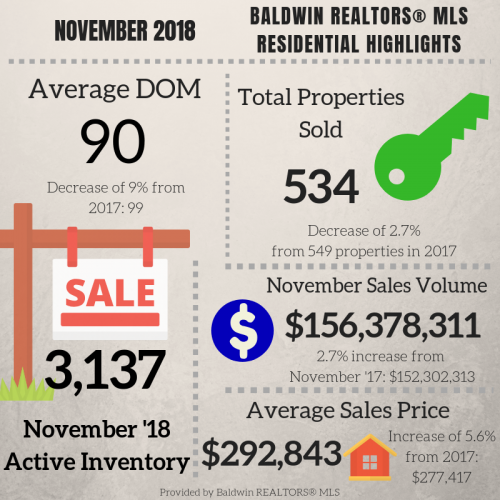 ROBERTSDALE, Alabama – Dec. 5, 2018 – Demand for Baldwin County property continues to rise, with an increase in sales volume, increased sales prices, and decreasing days property is on the market. The total amount of residential active inventory in November 2018 was 3,137. 534 properties were sold last month, a decrease of about 3% from November 2017: 549. Properties are staying the market for less days from 2017: decreasing 9% from 99 days last year to 90 days in last month. November total sales volume increased almost 3% this year, $156,378,311, from $152,302,313 in November 2017. The average sales prices of residential properties in Baldwin County this month increased 5.6% from 2017. Last year, the average sales price was $277,417, and this year, $292,843. Baldwin REALTORS® is the source for real estate in Southern Alabama. We provide resources, education and tools to over 2,300 professionals across the region. We work to protect the interests of property owners, and our members serve buyers and sellers as REAL Advocates, Advisors, and Experts. REALTORS® agree to abide by a strict code of ethics and are held to a high ethical standard by their peers through their association membership. The term REALTOR® is a federally-registered trademark owned by the National Association of REALTORS® and denotes membership in the non-profit Association.